What does 48-48 in overtime sound like? As Stanford knows well, it’s the flutter of tens of thousands of hearts collectively beating, a steady murmur throughout a crowd both drained by the ceaseless tension but still ready to erupt at a moment’s notice. In the David Shaw era, the Cardinal have heard this very sound twice: in 2011 against USC in the Coliseum, and Oct. 6, 2012 while hosting Arizona, the latter of which saw this mountain of anticipation amongst the home crowd burst into a full-fledged volcano. 48-48. In overtime. The Wildcats took the ball first and failed to score as fifth-year senior captain Chase Thomas intercepted Arizona quarterback Matt Scott. Now, it was Stanford’s turn. On that second-and-7, the Cardinal offensive line, along with fullback Ryan Hewitt and tight end Levine Toilolo, ripped a hole in the Wildcats’ front, allowing running back Stepfan Taylor to burst through the seam untouched before trotting into the end zone, a walk-off victory in the most literal sense of the term. 48-48 was now 54-48 as the palpable tension throughout Stanford Stadium evolved into jubilation. But for a moment that will live on in Stanford fan-lore as a “where were you when…” snapshot in time, the individual with the best view of this final play as it unfolded wasn’t in the stands or in front of a television screen, but in the backfield handing the ball off to Taylor: starting quarterback Josh Nunes. “You definitely have a unique perspective as a quarterback after you hand off the ball and see things opening up,” Nunes said, reflecting on the game’s final play three years later. Nunes, who beat out fellow quarterbacks Brett Nottingham and Kevin Hogan for the starting job in training camp, experienced the highs and lows of playing the position almost immediately as he stepped into the mammoth shoes left behind by Heisman runner-up and first overall draft pick Andrew Luck. 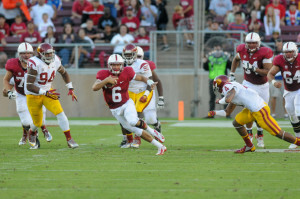 For his part, Nunes was not fazed and was instead driven by a belief that Stanford’s offense still had the potential to do something special. The sense of urgency paid off for the Cardinal offense and Nunes, in particular, as the defensive struggle a week earlier in Seattle gave way to a shootout. The game itself started off quite harmlessly, with no foreshadowing of the all-time classic that was to unfold. The score at the end of the half read Stanford 7 – Arizona 13. More of the same from the week before. Down seven in the final period of regulation, the Cardinal committed their lone turnover of the afternoon as sophomore Ty Montgomery lost a fumble. The Wildcats immediately responded with a 6-play, 45-yard touchdown drive. Arizona was now up by two scores, and Nunes and the offense found itself in the strange position of having to bail out the normally-stout 2012 defense. “They had bailed us out a number of times throughout the season, and having the opportunity to help bail them out was something really good,” Nunes said. With Stanford’s back against the wall and reality of a 1-2 conference record slowly setting in, Nunes turned a solid performance into a heroic game for the ages. After the senior rushed into the end zone to cut the lead to seven, the Cardinal defense forced a three-and-out. Moments later, with 1:21 left in the game and facing a fourth-and-9 from the Wildcats’ 20, Nunes delivered a strike up the middle to tight end Zach Ertz at the 3-yard line to keep Stanford’s Rose Bowl dreams alive. On the ensuing play, Nunes found the end zone again on a 3-yard quarterback keeper. With 45 seconds to go, Stanford had come back to tie the game. In overtime, though, Rich Rodriguez’s squad failed to advance past the Stanford 13-yard line as Henry Anderson tipped Scott’s pass before Thomas snared it out of the air, a play that invigorated Nunes and the offense as they looked on from the sideline. “All of us on the sideline were watching. When we’re not talking about the offense and the game plan — we’re out there cheering on the defense,” Nunes remarked. Two plays later, the red sea parted for Taylor, and the entire Stanford sideline proceeded to mob the senior running back in the end zone as the crowd cheered with equal parts elation and amazement at the events that had just unfolded. Nunes, as well, recognized in the immediate aftermath that he had just been a part of an all-time classic as he finished a career day going 21-of-34 for 360 yards and 5 total touchdowns, three of them on the ground. This weekend, as Stanford prepares to host Arizona again on The Farm — three days before the three-year anniversary of that famed 2012 battle — Josh Nunes won’t be there to conjure up another magical comeback. In fact, he won’t be anywhere near Stanford Stadium, working hard instead on his new startup business crafting crosses in his new home of Bend, Oregon. After that Arizona victory, the pinnacle of his athletic career, Nunes’ football life began to take a turn. A close loss to Notre Dame, followed by inconsistent performances against Cal and Washington State ultimately led Shaw to hand over the reins of the offense to redshirt freshman quarterback Kevin Hogan, who proceeded to lead the team to an upset over No. 2 Oregon, a Pac-12 title and a Rose Bowl victory. Nunes, though, still played an integral role in the locker room and on the sideline throughout the remainder of the season. Nunes was undoubtedly expected to be a leader throughout the 2013 offseason as well before returning that season as the seasoned backup to Hogan. Instead, life delivered a curveball. During an offseason workout, Nunes’ football career was abruptly cut short as a weightlifting accident left him with a ruptured pectoral. Two months later, he made the decision to medically retire from the game he loves. Josh Nunes the football player gave way to Josh Nunes the engineer and serial entrepreneur. Following his injury, Nunes finished his bachelor’s degree in Management Science & Engineering with a focus on entrepreneurship and returned to Stanford the following year to complete his coterminal master’s degree in social psychology. After completing his graduate studies, Nunes spent time in Europe with National Geographic before returning to the States and relocating to Oregon, where he founded Believe Cross, a company dedicated to the family dream of producing handcrafted, artisan crosses. A devout Catholic, Nunes’ faith was a central part of his experience at Stanford, both inside and outside of the football group. During his time on The Farm, he was a member of many small-group Bible studies and helped found United Pursuit, an organization dedicated to bringing athletes and non-athletes together through Christianity. With Believe Cross, Nunes hopes he can share these positive experiences with others and contribute to greater community discussion surrounding faith. On Saturday, it’ll be hard not to think purely of Josh Nunes the quarterback — of the man who had the game of his life three years ago. His performance reignited a stalling Stanford offense and kept the Cardinal’s hope of a Pac-12 title and a Rose Bowl berth alive. Although Nunes would be the first person to point out that that 54-48 win was a total team effort, there’s no question that his elevated level of play made the difference in a shootout that could have easily swung the other way with just another misstep. It was a legendary performance in a game that will be remembered for years, an inspiring comeback that captivated and entranced at least one freshman watching his first home game in Stanford Stadium. Enough so that he chose to write about it in the school paper three years later.